This entry was posted on Friday, April 30th, 2010 at 8:21 pm	and is filed under Uncategorized. You can follow any responses to this entry through the RSS 2.0 feed. You can leave a response, or trackback from your own site. RA is not an easy thing. While I have never had an infusion, I say pay the extra if you can afford it if it makes you feel better. We need these small things to get through all the bad things. Something that is supposed to make you feel better shouldn’t come with such a high physical cost. Don’t feel guilty for taking care of yourself. 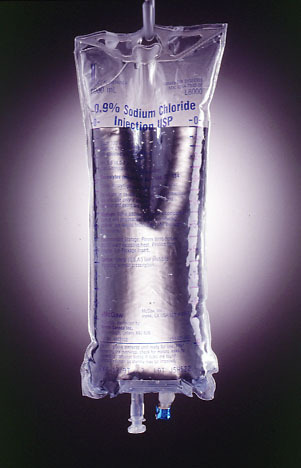 I’ve heard more stories about bad experiences with IV infusions of the RA meds, so if I were you, I’d stick with getting them at the hospital. Sounds like you might need to switch RA docs. It’s good to hear that your most recent infusion went so well. Now you have something to compare. I haven’t ever had the infusions, but my impression was that patients aren’t supposed to be left alone. A letter to your doctor requesting a correction to your inaccurate medical record would hopefully get the problem with your meds list fixed. It would be great if you’re able to keep the good doctor, but go to the nicer infusion center. Keep us posted. Anyway, glad you had a good experience this time out (and with chocolate to boot!!). I so hope the cost is not that huge and you can return. The hospital infusion sounds so personal and lovely. We need that, don’t we? This post is quite timely for me. I just found out that I’m going to be starting remicade. Thank you for detailing what to look out for. After reading your blog post twice, my reaction is that perhaps the doctor doesn’t know about the failures with his office staff. Perhaps you can have him read your blogpost? Frequently doctors go about their medical business and aren’t at all involved in the office side of things. At the very least I would mention to him that the difference in time alone made a huge difference in how you felt and that you no longer feel comfortable having the remicade given to you that quickly. I think it’s a more and more common problem that many of us have to make a decision on our healthcare based not what’s not best, but what is cost-effective. I agree with these posts, if you can keep your doctor and afford to go to the hospital, that would be the best. On top of all the benefits, the hospital is always open so you wouldn’t have scheduling problems. On a different note, I thought my first rheumatologist was terrific. He is a masterful clinician, but his office staff is terrible. After the second time I waited until after 4:00 for an 11:00 appointment, and dealt with rude staff, I decided I needed another option, even though I felt I had an incredible doctor. I love my new rheumatologist and her staff is great, caring, professional. I understand your attachment to the doctor, but sometimes you have to look at the overall quality of your care. But in the meantime, I hope, like others who have commented, that you can continue to return to the hospital. 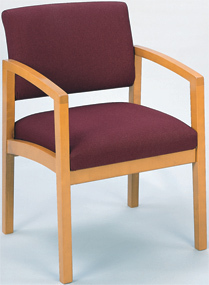 And if not, would you be more comfortable on the exam table where you can somewhat recline? Carla – the exam tables are tiny, and you can’t really lie down on them – or you can, but your legs are hanging off. I tried this once, and was even more uncomfortable than in the chair. I think there’s a way to extend the table, but the office is too small and they have a chair in the way that prevents it, with no good place to move it. Weird, I know. It’s a strange little office. The doctor says he is looking for a new space, but it’s been a long time now and it hasn’t happened yet. Thanks for the support, everyone. I’ll let you know what happens when I get the EOB! I am very curious to see what the cost difference is. I’m going to have a serious talk with my doctor at my next visit about the differences I saw, and see if there’s any way to make the experience at his office better. If there isn’t, and the cost difference is prohibitive, it may be time to look for another doctor, sad as it makes me. I’ve already talked to him about the other staff problems, especially the late billing, and he was already aware of them. My doctor has a large infusion room at his office that has about 10 recliner type chairs. There is a large screen TV playing, pillows, blankets, and nurses regularly take vitals. There are 2-3 nursing personnel manning a large desk in the room at all times. They mix and prep the infusion in a small workroom adjoining the infusion room, and do so after we arrive. I have noticed some reaction issues, including BP fluctuations, jitters, and chills, when the infusion went too quickly, but the nurses slowed it down as soon as I told them how I was feeling. It’s not quite as comfortable as the hospital experience you describe, but I’m very grateful not to have had your doc’s office infusion experience. He needs to read this post of yours…seriously! You shouldn’t feel at all guilty about taking your infusion with cancer patients. 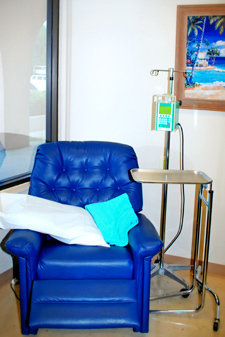 Remicade is a form of chemotherapy, even though the dosages are smaller than typical cancer chemo meds. Chemotherapy doses and meds vary depending upon type and severity of cancer as well, so don’t feel you are undeserving of a bit of pampering. Consider also that most chemo patients undergo this treatment for a few months, and are then free of it, while we may have to be taking these types of infusions for many years. Blessings from a fellow remicade sister. It’s so awful to think of you having to get infusions the way you described at your Dr.’s office. Makes me sad. If it brings any comfort and peace to have it done at the hospital–I say go for it. Comfort when dealing with pain is priceless, right? It’s nice to “meet” you, Kelli! I’ve added your blog to the links on my home page, and I’m looking forward to reading more from you! It’s always great to meet other moms with RA. I have a hard enough time with one kid – four must be tough! I’m glad my blog has helped you, and hope you get a lot out of writing yours! Thanks for commenting, Sunny – it’s good to hear from other Remicade patients about their experiences. I’m starting to think that the situation at my doctor’s office is unusual, and not in a good way. Your description sounds more like how it should be. So great to meet another mama too. Four teaches me a lot everyday. : ) So sweet of you to add my blog. Thank you. I forgot to tell you that your music is beautiful and I love the poetry of it. I am also an artist–only my medium is drawing. May you continue to find joy and comfort in your music. I was searching prednisone and found your blog. I recently stopped receiving remicade infusions for colitis because the last four times I had them I started having reactions. This was over a 8 hour infusion. Besides when hospitalized, all my infusions have been in an infusion clinic for my medical group. The first one I had a private room and bed but nurses came by at least hourly to check vitals. My other clinic was way better. They had remicade on site so the # of vials I received could be adjusted based on weight (especially after prednisone weight gain). I only had a recliner and tv, but the nurses were much better at IV lines and were always in the room monitoring us or moving blankets, unplugging us to go to the bathroom. It was hard being the patient in there the longest , and at 29 years old seeing all these older people in and out in couple hours. Be very careful about delaying infusions as i predict (from reading) that my reactions are related to time between doses. i am back on high dose prednisone and being reffered to a surgeon. I just found this site. I am starting Remicade infusions next Tuesday, 8/17/10. I am a 62 year old disabled vet with Ankylosing Spondilitis and Crohn’s disease. I will be taking the infusions at the Portland VA hospital, though I live 180 miles away. I will report to their out-patient clinic. I will report how this all goes once it is done. I really wanted to just say Hi for now, and tell you how good it is to hear that things can go well with Remicade. I am a bit skeptical and even scared at this new turn in my treatment regime. This will be an interesting experience. Oofer – good luck with your Remicade infusions! Please do let me know how it goes. It is certainly scary starting a treatment like Remicade – I remember that it was very hard for me emotionally in the beginning. It has taken me a long time to get to the right dose, but I’m happy to report that I seem to be doing really well since my latest increase. Haven’t had a chance to write about it yet, but I will soon. Thank you so much for sharing your experience with your infusions. I’m going to be starting my infusions this week, and you helped me have a much better understanding of what to expect and I really can’t thank you enough! I wish you well on your journey!